OKLAHOMA CITY -- The remains of five gas rig workers missing since a fiery explosion in eastern Oklahoma have been recovered, authorities said Tuesday. Pittsburg County Sheriff Chris Morris said once the natural gas drilling rig was stabilized following the blast and subsequent fires, employees from the state medical examiner's office went into the wreckage and recovered the bodies in about two hours. "The bodies were located in the area where they were presumed to be working in, what they call the 'dog house,'" Morris said, referring to a room on the rig floor that generally serves as an office for the drilling crew. He said state and federal investigators will work with the companies involved to determine how the blast occurred. The workers who were killed include three from Oklahoma -- Matt Smith of McAlester, Parker Waldridge of Crescent and Roger Cunningham from Seminole -- and two from neighboring states, Josh Ray of Fort Worth, Texas; and Cody Risk of Wellington, Colorado. Morris, whose office was responsible for notifying the families of the workers who were killed, said it has been a difficult two days for everyone involved. "I think you can imagine, they're not doing well," Morris said. "No law enforcement officer likes to do that. The family not knowing and feeling empty about where their loved ones are, it's a tough situation." 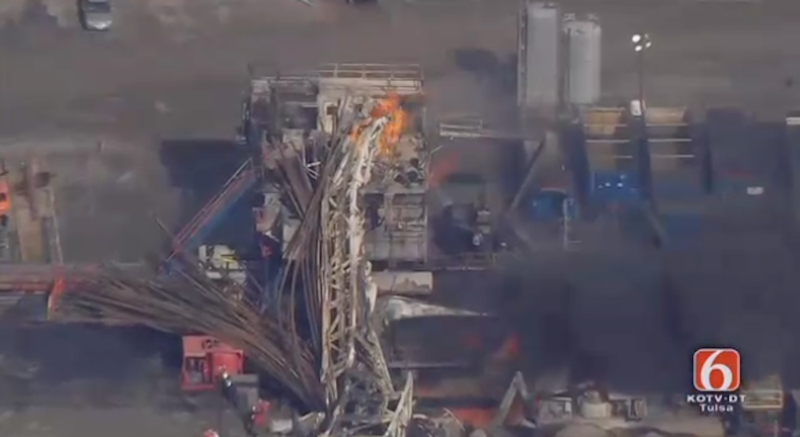 Three of the workers were employed by Houston-based Patterson-UTI Energy Inc. Company president and CEO Andy Hendricks pledged a full investigation into the explosion. "We want to learn from this," Hendricks said. "We don't want this to happen again for anybody in our industry." The explosion at the drilling site near Quinton, about 100 miles southeast of Tulsa, sent plumes of black smoke into the air and left a derrick crumpled on the ground. For much of Monday, emergency officials were unable to get near the rig because the fire was still burning. Emergency management officials later said the fire was extinguished. Authorities said 16 people who were on the site at the time of the blast escaped without major injuries. One person was airlifted to a hospital. The cause of the blast is not yet known. Nationwide, there were 101 oil and gas-related fatalities in 14 states in 2014, the most recent year for which data is available from the National Institute for Occupational Safety and Health. Most of those occurred in Texas, Oklahoma and North Dakota, all three states with robust industry activity. Most fatal incidents involved workers from servicing companies, but drilling companies accounted for 27 fatalities, the second most of any oil and gas industry group, according to the study. A total of 15 workers were killed in Oklahoma while working in mining, quarrying and oil and gas extraction jobs in 2014, including six that involved transportation incidents, according to the U.S. Department of Labor's Bureau of Labor Statistics.